Featuring 4 yurts located with spectacular views of the Chilkat Inlet in Haines Alaska. Also featuring a Lodge for hosting your function! Private beach, forest, trails for guests' enjoyment. Yoga center and meditation building onsite. Chilkat Inlet Retreat has been the long-time dream of the hosts, Beth and Gregg. For two decades, it has been a destination for weddings, memorials, yoga retreats, board retreats, or spiritual retreats and hoe-downs. 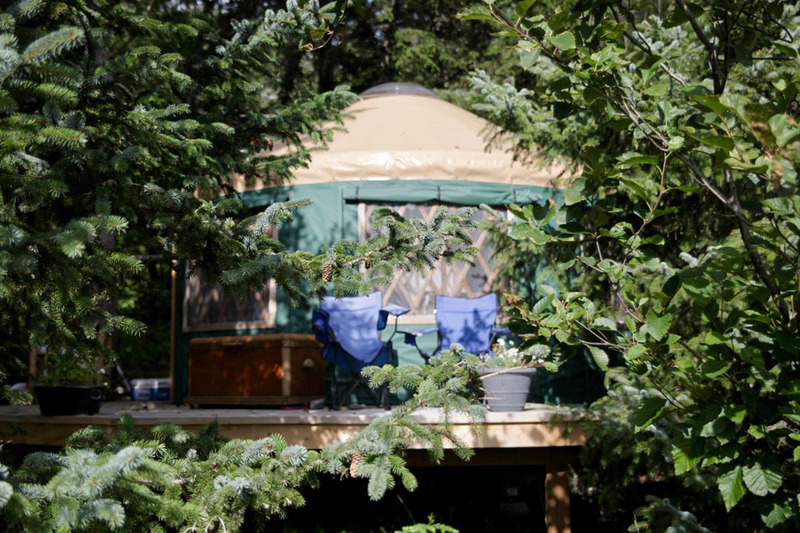 The yurt rentals are the most recent addition, offering individuals the opportunity to stay on the land. Because of the natural beauty and serenity of the location on the tidal Chilkat Inlet, the emphasis is truly on “retreat.” Casual facilities promote a restful and joyful atmosphere for individuals or small groups. Take a break from busy lives elsewhere. Bring your book, your instrument and your yoga mat. Saunter down the path to the meditation building for the practice you’ve been promising yourself. This is a place for simple food, rest, study and lots of smiles. Chilkat Inlet Retreat is located 4 miles southeast of Haines, along Mud Bay Road on the Chilkat Peninsula. Facing south and across the inlet are the Chilkat Mountains topped with glacial ice and spectacular views that change daily due to the variable weather. Brilliant sun or days of rain, flat calm seas or roaring surf, temperatures from 50° F to 80° F, summer tides (2017) range from -4.9 feet to 20.3, it’s all dramatic and beautiful! Late April and early May is the glorious time of renewal with longer daylight hours and exploding greenery. A great abundance of sea life follows the small smelt-like fish called eulichan, a “run” that brings whales, sea lions, seals, otters and migrating birds galore into the inlet. May is a busy month when gardens are planted and the boats and nets are readied for the salmon season. In June, our friend and neighbor, Sarana—www.saranayoga.com— hosts her first yoga retreat. On most Thursday nights, neighbors and guests are invited for fresh salmon barbeques, a potluck and the anything goes jam session. There are many adventures in the Chilkat Valley to explore, trails and excursions included. You have the option for solitude or socializing. But the feedback we most commonly hear is that this is a place of personal restoration.